Following a brief pause after the economic crisis, health expenditure is rising again in most OECD countries. Yet, a considerable part of this health expenditure makes little or no contribution to improving people's health. In some cases, it even results in worse health outcomes. Countries could potentially spend significantly less on health care with no impact on health system performance, or on health outcomes. 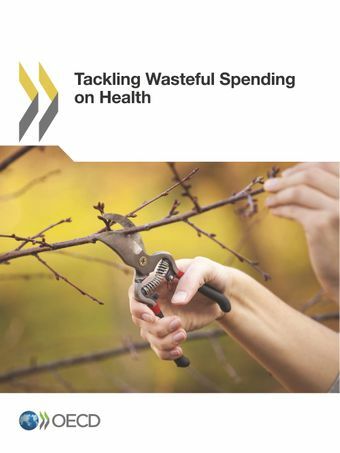 This report systematically reviews strategies put in place by countries to limit ineffective spending and waste. On the clinical front, preventable errors and low-value care are discussed. The operational waste discussion reviews strategies to obtain lower prices for medical goods and to better target the use of expensive inputs. Finally, the report reviews countries experiences in containing administrative costs and integrity violations in health. Administrative spending in OECD health care systems: Where is the fat and can it be trimmed? The report was launched during a high-level policy forum jointly organised by the OECD and the King’s Fund and attended by around 200 stakeholders in London on January 10, 2017. Rt Hon Jeremy Hunt delivered a keynote address. Also access extracts of the report in French: Lutter contre le gaspillage dans les systèmes de santé : Synthèse. Cette synthèse est une traduction partielle en français du rapport et contient l’avant-propos, les remerciements, la table des matières, le résumé ainsi que le chapitre 1.